😀 I really love it! It’s so much fun to read! Thank you so much for commenting! This book looks interesting. I’ll definitely be checking it out, thanks! Steampunk? Going on my ‘to investigate further’ list. 😀 Something steampunk always goes straight to that list. Steam punk is a genre I’ve been meaning to read more (read: any) of. I think I may give this one a shot! Steam punk is a genre I’ve been meaning to read more (read: any) of. I think I’ll give this one a shot! P.s. sorry if this posted twice. I’m battling technology, and it is winning. Steampunk is awesome! 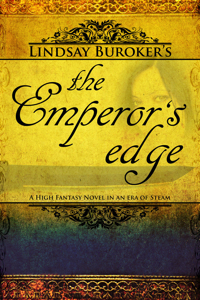 The Emperor’s Edge is a great introduction to steampunk. I definitely recommend it as well as Leviathan for first time steampunk books.